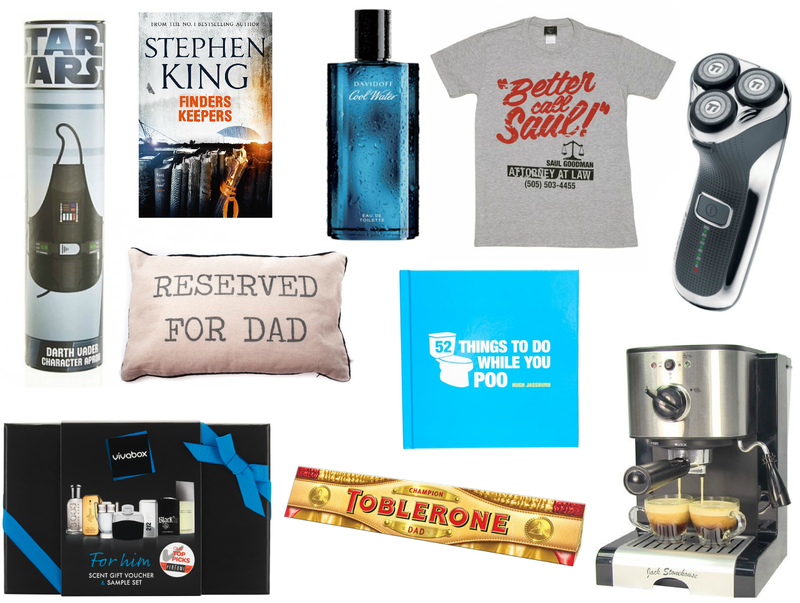 With Father's Day just a mere few weeks away I thought it was a good a time as any to whip out my gift guide for 2015! I really enjoy doing these for certain events, Christmas/Mothers Day/Fathers Day every year there's so much more to choose from.. especially online! I mean.... it's pretty self-explanatory! A nice bit of humerous reading material to keep him company on the porcelain throne! A total bargain at Boots right now! Only £24.99 for a 125ml - that's half price and cheaper than the 75ml! It smells perfect for a special Daddy! If your Dad is obsessed with Breaking Bad like mine was check out this cool range of T-Shirts at Truffle Shuffle, I love this Better Call Saul one! I mean - spot on really isn't it! Whether it's for the living room sofa or Dad's favourite arm chair, this is a lovely finishing touch for the home! Book lover? Retired papa who has lots of time on his hands! This Stephen King book was only released this month, get a brand new novel for a tiny price on Amazon. What male wouldn't want a brand spanking new shaver from their lovely child? Now this WAS half price.... but it appears to have shot back up in price before I have uploaded this post... not cool! But here's a few more with whopping savings ... here, here and here! With summer on the way I think we all know who's going to be getting the BBQ and tongs out! Celebrate the new Star Wars AND give your Dad an excuse to be head of the barbie with this awesome apron! Can't beat a bit of personalised chocolate now can you? Perfect little extra! I've mentioned these before and still stand by the fact that they are an incredible idea! A box full of fragrance samples for your father to pick his favouirte from and one special voucher inside which gives you a full sized bottle of the chosen scent for free! A great way to give them something you know they will like! Last but not least.....a coffee machine! I saw the price of this and thought I had to include it in this gift guide! Less than £50 and some bloomin' good reviews, this is a great treat and something a little different that they may not think of buying themselves. Yes! I love toilet books. haha. great ideas, i always get my dad toblerone haha. Dad ideas but my boyfriend would love that star wars apron!